Nocturnal Media are going to launch a Kickstarter for Scarred Lands today! Starting Tuesday the 5th, the Scarred Lands return as the Kickstarter for the new edition of Scarred Lands Players Guide goes live! Hosted on KS by our partner, Nocturnal Media, this Kickstarter is not only for a new edition but for a print run to get those new books into stores! The Kickstarter begins at Noon CST. Link will be provided here. In the heady days of the D20 explosion, White Wolf created our own fantasy setting featuring a world devastated by the brutal war between gods and ancient titans. Starting Tuesday the 5th, the Scarred Lands return as the Kickstarter for the new edition of Scarred Lands Players Guide goes live! Hosted on KS by our partner, Nocturnal Media, this Kickstarter is not only for a new edition but for a print run to get those new books into stores! I don't see the actual link yet. If anyone else sees it, please post the link so that we can see what's in the main goal and if there are any stretch goals. I always felt that the existing Scarred Lands was presented in a way that was too DM oriented, so I think a Player's Guide is a good move. Not sure if I can afford getting into another KS right now, but this one is tempting. You can see a better version of the cover painting on the Scarred Lands page on the Onyx Path website. Havard wrote: I always felt that the existing Scarred Lands was presented in a way that was too DM oriented, so I think a Player's Guide is a good move. Not sure if I can afford getting into another KS right now, but this one is tempting. I always felt that they made Scarred Lands up, as they went along, in order to give them an excuse to create 3rd Party Publisher books aimed at 3e D&D groups. So that could mean that they were aiming it at GM's rather than players. I think that the gazeteers are probably more player oriented than the campaign setting books. To be honest, they could probably grab the 3e SRD, create a Scarred Lands Player's Guide, Scarred Lands GM's Guide and Scarred Lands Monster Manual from that, and simply carry on selling the existing books (with the d20 System logo removed). But I think they are making the switch to try to tap into a new player base. I'll be interested to see if the new product line focuses more on trying to be "generic books that any Pathfinder group can raid" or if it focuses on being "a product line for Scarred Lands fans". One thing's for sure. With this being the "second edition of Scarred Lands" they have the opportunity to fix any bugs in the original products and build on the most successful parts of the campaign setting. Scarred Lands—FRPG setting in both 5e & Pathfinder editions is up! It already has 25 backers and has taken in $1,490 of the initial $20,000 goal. Oh yes! great to see they are aiming for both 5e and Pathfinder. And that cover looks wonderful! Nine days to go and they have raised $38,421 of the $20,000 goal, meaning that Scarred Lands will come back. The next stretch goal is at $40,000 USD. Gentlemen! My heart soars to see you guys still carrying the Scarred Lands torch. Haazeven, I still remember when just a few of us were still posting at the old Scarn.com! The Kickstarter has hit $46K! I'm REALLY hoping for $60K. Scarred Lands Lives! 60k has been reached this morning. Wouhou! haazeven wrote: 60k has been reached this morning. Wouhou! And more than 1,000 backers too. I didn't see what the 1,000 backer target was for. I ended up not backing this, mainly due to the high shipping costs to Europe. 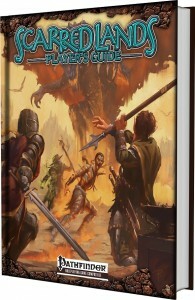 But I hope to get a chance to pick up the 5E guide once it becomes available to non-backers. Glad to see the Kickstarter being successful! Havard wrote: I ended up not backing this, mainly due to the high shipping costs to Europe. But I hope to get a chance to pick up the 5E guide once it becomes available to non-backers. Yep. Those high international shipping costs really add to the total cost of ownership. It's a shame they couldn't arrange European Print-on-Demand printing, like DriveThru does. I am hoping that, after the Kickstarter ends, they will put these new products up on DriveThru RPG, so that people in Europe can by them for the same price as people in the USA. Havard wrote: Glad to see the Kickstarter being successful! The Kickstarter is not the end of it. As well as raising getting 1,017 backers to give them $67,731.00 on Kickstarter, they have also got 869 backers to give them an extra $6,318.69 on a follow up Backerkit campaign: Scarred Lands Player's Guide — Fantasy RPG setting for 5th Edition & Pathfinder.